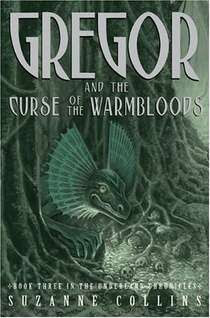 Gregor and the Curse of the Warmbloods was written by Suzanne Collins. It is book 3 of 5 in The Underland Chronicles. This third book continues the saga of Gregor's adventures in the amazing subterranean world under New York City. This time the 11-year-old is trying to save victims of an Underland plague, including Ares, his giant bat bond-mate, and Gregor's own mother. The quest for the cure takes the boy and his friends into new sections of the Underland where plants are carnivorous and a giant lizard serves as a guide. The Overlander is again joined on his quest by Boots, his toddler sister; Ripred, the rat; and Temp, the giant cockroach. As before, the quest is guided by a prophecy that only becomes clear in the later stages of the book. Collins maintains the momentum, charm, and vivid settings of the original title. The characterizations continue to be complex with each new book, revealing new sides to familiar individuals. I have to say I really enjoyed how face paced these books were. There was very little downtime as the story progressed. They were just packed with action and adventure (on a very young adult level... or not even young "adult".) Sometimes I'm just happy to read a book that is just fun.